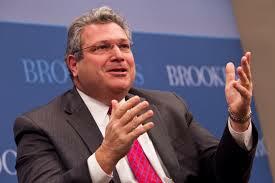 Robert Kagan(1) is back. In his recent article on WSJ, with his classical realist pessimist self-fulfilling prophecies of inevitability of violent conflict because of “has always been like that”, he explains us that similarly to Europe after WWII, “who sought an escape from the tragic realities of power that had bloodied their 20th century”, the US, after Iraq and Afghanistan wars, “seems to be yearning for an escape from the burdens of power and a reprieve from the tragic realities of human existence”. And it goes without saying that for Kagan human existence is based on power, conflict and war. In its very much debated and famous article written on the aftermath of 9/11, “Power and Weakness”, he explained to the world how the US and Europe were to be considered always on a different track in their approach to international politics, order and security. We had “to stop pretending that Europeans and Americans share a common view of the world, or even that they occupy the same world”(2). The bases of unipolarism were explained with this impacting analysis and the “New American Century” had to start, because Europe and the US had different identity and perceptions and could not go together towards a new world order after the end of the Cold War. Kagan believed that the European insignificance in solving major conflicts was based on its faith in the international law: European comes from Venus, with a vision of peace and rule of law while Americans comes from Mars, with a dream of “Life, Liberty and Pursuit of Happiness”. Let’s analyze more in depth his old “Power and weakness” article, to see from where comes his idea that “raw force remains a key element in international politics”. The sharp distinction that Kagan did between the US and the EU didn’t give much space for mutual rapprochement, as the US will always be more prone to the use of military force while European will always look for diplomacy and less harder interventions (like economic sanctions). According to Kagan this depended not only on different military powers and ability to project them (when European powers were strong they were using strength and martial glory, now it was the turn of the US) but on their identity based on different values: America has a Hobbesian vision of the world while Europe a Kantian one. So the European project and the mere maintenance of peace in Europe has always depended on the American military protection with the NATO presence (a clear realist view that deny any role to economic interdependence or construction of common values) not on the idealist construction of integration and institution of supranational sovereignty. Today, Kagan says, also “a majority of Americans (and of the American political and intellectual classes) seem to have come close to concluding not only that war is horrible but also that it is ineffective in our modern, globalized world”. And instead of considering it an achievement he defines it a danger. My criticism to Kagan (and all the realists as Mearsheimer) is that even if he is right on shaping the differences of identity between the US and Europe and on the fact that European invasion from Russia could have been avoided overall because of American presence, the European “Kantian paradise” is not a result only of the US protection. France and Germany didn’t attack each other anymore not because of the American presence but because of the will to build a ‘new identity’, based on the European integration. As constructivism teaches us ideas shape policies and social practices creates new ideas and new identities. Plus the US never had fortunately the experience Europeans had of national ideological folly and war tragedies since millennia and this make the American realist analysis unable to grasp European reasons behind its evolution. As Cicero said “history is master of life” so if Kagan and his realist friends keep just looking back to history, from Peloponnesian war to WWII, just as a cyclical repetition, they are not helping to envision the future, on the opposite: they are trapped in a self-fulfillment prophecy of repeating the past. True, the European legal order is something that is still in process, but an international order based on law cannot be created “from the day to the night” (as we say in Italy) in particular in a world that is constantly shifting and moving from one side to another as our modern globalized, complex and liquid world. Each institutional building that change the bases of an international system needs time as it must change minds and hearts of people and political wills of states. The fact that the ICC born after many years of discussion (even if with many countries outside its sphere of action, like the US indeed) is a demonstration of that. Besides this we saw also how long the American unipolar moment lasted, with the disaster of Iraq war and the consequences we are living today, so we cannot take for granted that the diplomacy is not a valid approach to security as much as powerful interventions. Even if the US is now still a “primus inter pares” it has not anymore the global hegemony, and notwithstanding the fact that is the world’s longest democracy and wants to bring freedom and happiness with its Manifest Destiny, we can say with President Jimmy Carter that “America didn’t invent the human rights, human rights invented America”(3). So it is time for the US to stand up to its democratic principles (created in the European enlightenment) also on his actions in international arena. America has to listen to other perspectives of great or less great powers overcoming the thought of being the only entitled power that have the duty to bring order to the world(4). At the end of the day the recent diplomatic efforts of the US and Europe in the Middle East (Iran, Syria and Palestine) demonstrate that the US is starting a new track respect to what Kagan keep saying about the ‘inevitability of Hobbesian intervention’ (since already the “New beginning” speech of Obama in Egypt in 2004). And I believe that Middle East has to be let to govern itself sooner or later, as Jeffrey Sachs argue(5) , as the regional powers of Iran, Turkey, Egypt and Saudi Arabia will have to decide by themselves if going on during this century with their cleavages and national interests or create a community of security and economic integration (as the EU did, even if after two world wars) for the stability of the region and as a seed of the future world order. 2) Robert Kagan, Power and weakness, Policy Review, June/July 2002. 4) See on this “The Irony of Manifest Destiny: The Tragedy of America’s Foreign Policy”, William Pfaff, 2010. Previous PostFree speech alive at nation’s universities? An article from Kathleen McCartney (president of Smith College in Northampton, MA)Next PostHow two important Muslim countries, Turkey and Indonesia, can contribute for more peace, tolerance and economic growth in post-Western world?